North Fork of the Yuba River, good to see it flowing well. Crossing Hwy 49 felt special because it was the PCT boundary for the Sierra section, although geologically we've been in the Sierra Nevada since leaving Mt. Lassen. 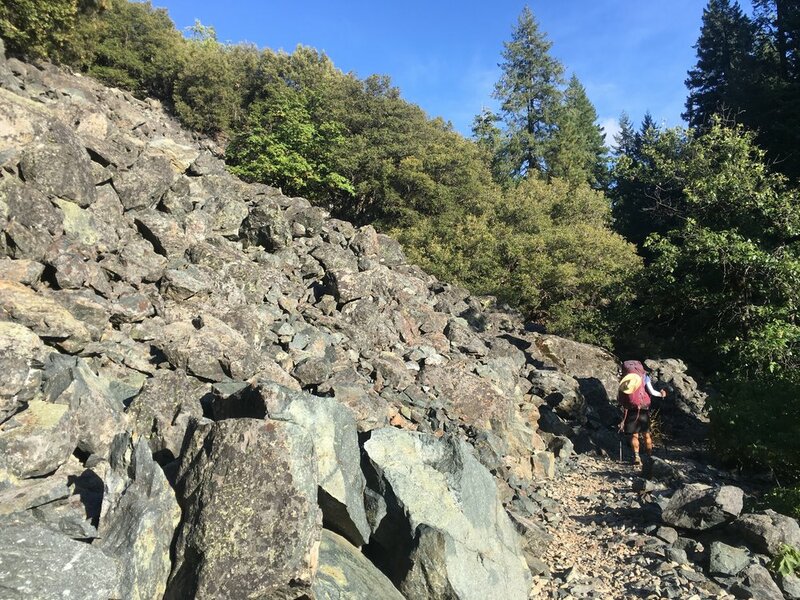 We followed the trail from the road towards the roaring sound from the north fork of the Yuba River, and we soon came across a hand-painted sign that read "Pacific Crest Trail footbridge, and beyond." It summed up where we were headed and made us smile. 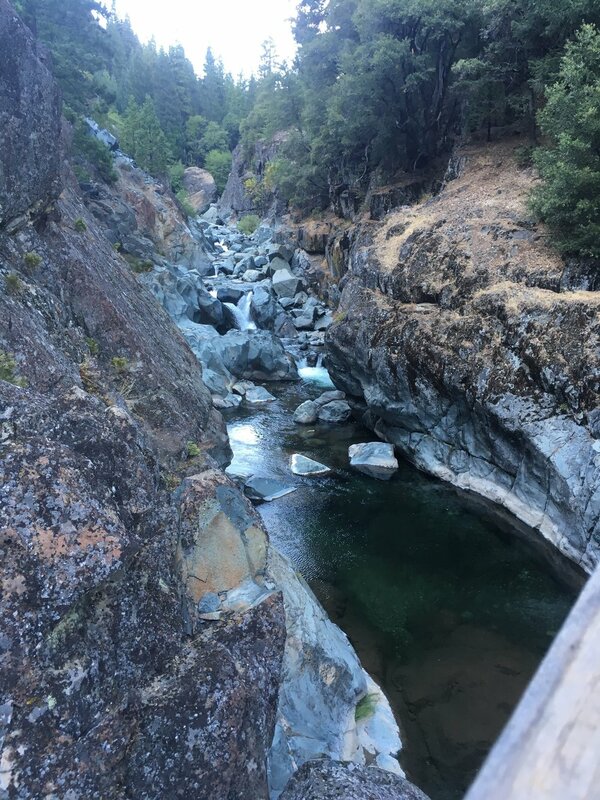 Soon we found ourselves crossing a graceful steel and wood bridge spanning the polished bedrock and boulders over which the clear waters of the Yuba tumbled. It was a beautiful sight. We headed up the trail and said our final goodbye (hopefully) to both poison oak and the flying little terrorists as we ascended. Both Huckleberry and I were excited that this is the lowest elevation we would see for the next several weeks. We climbed out of the oak and manzanita forests and crossed Haystack Creek then followed the trail along the drainage of Milton Creek. The forest became more dense and dark, with Douglas fir and Incense cedars dominating the canopy. We crossed Milton Creek twice before arriving at a wonderful campsite just beyond the upper bridge. We even had time to clean up at the creek and get dinner started before darknesss fell. Just as dinner was ready to eat, I saw a headlamp headed our way, and Stringbean arrived asking to share our site. He had passed us in the early afternoon, resupplied in Sierra City, and pushed to get out for a few more miles. We all chatted briefly before hitting the sack. Leaving behind the oak forest for the firs and Incense cedars. The morning of Day 71 was chilly and it took me a few costume changes to find the right combination of clothes to keep me comfortably warm but not too hot. Fortunately, we made a steady climb up away from the creek and onto some exposed high slopes that brought direct sunlight and my core warmed up quickly. The last of the cold finally left my finger tips as we hit the rim of the canyon. Around us there was still low brush but now it was joined by Jeffrey pines. The delicious scents of butterscotch from the trees and mint from the Pennyroyal along the trail wafted on the breeze, making for a fabulous morning walk. We had some views of enormous Jackson Meadow Reservoir before dropping down to traverse a ridge further to the east. 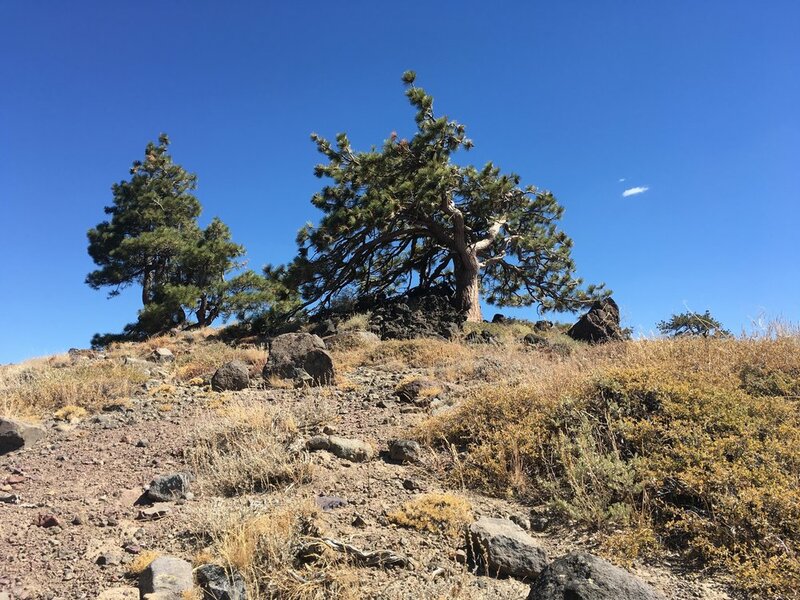 The trail is now taking us towards the north end of Lake Tahoe and the higher elevations of the Sierra, which we will reach in the coming days. Although we are still making southerly progress, each step today is also taking us further east. The forest restoration in progress. Twenty years of growth and more to come. These amazing rock outcroppings kept us riveted to the ridgelines. Jeffrey pines take on extraordinary shapes on the windswept ridges. Early afternoon brought us our first long views of the broader landscape around us, as we broke out of the forest on high ridgelines. First, we walked through an area that was logged ~20 years ago to clear dead and diseased trees and replanted with Jeffrey pine and White and Red fir. It was astounding to see how small these newer trees were for being 20 years young and this made us realize just how old the surviving mature trees that towered over us must be. After passing through this grove, we popped up onto a golden ridge pockmarked with deep grey-black outcroppings of sedimentary rock. The golden color extended as far as we could see and it was composed almost exclusively of dried mule ears. 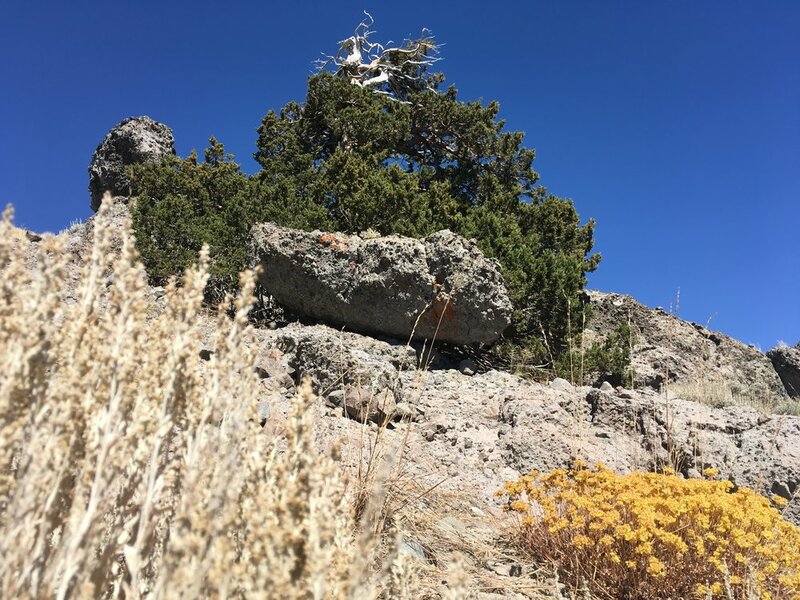 We sat in the shade of a stunted Jeffrey pine next to one of these outcroppings for a snack break. From there the trail stayed high along several connected ridges, all covered with mule ears giving everything a lovely autumnal hue. The rattling of dried leaves in the wind was music to our ears. Along the way, there were heaps of banded ground squirrels frolicking through the plants and up onto the rocky outcroppings. I saw a few doing some dynamic climbing moves that our climbing friends would kill to be able to replicate. These higher elevation slopes also had majestic Western white pines along with our beloved Jeffrey pines. Many were sculpted into fantastical shapes due to the wind exposure and harsh conditions. Walking across these ridges as we get ever nearer to the high country made us both feel at home and brightened our day. Golden mules ears are a sure sign of autumn in the mountains. The golden slopes and Western White Pines a perfect backdrop for Huckleberry and me hiking into the later afternoon. Mile after mile we were on these magical dry, golden slopes and we didn't want them to ever end. Alas, we eventually dropped down into a mixed forest of Mountain hemlocks, White and Red firs, and more stately Jeffrey pines. We skirted a few alpine meadows in these slightly lower elevations, with telltale swaths of willows surrounding the water sources. Normally, willows are a bane to us as we often have to bushwhack through them on our off-trail Sierra adventures, but today they were a harmless and somewhat enjoyable familiar sight in our favorite range. We ultimately continued to drop in elevation further and left the ridge altogether for the valley below. We crossed a few dirt roads and went through a small area of recent logging, then came across a glade of trees marked in red and blue. Looking at them it seemed that "blue" was to keep and "red" was to be cut, likely to thin the forest around the meadow and near the trail. Fortunately all of the mature trees right next to the trail were marked in blue. Leaving the glade behind us, we crossed a small bridge over White Rock Creek, our destination for the night. We set up camp and again had time to wash up before the sun dipped below the horizon. The temperature dropped significantly once the sunlight was obscured by trees, yet another reminder of both our elevation (at ~7600' this is our highest campsite of the entire trip so far), and the season. Pitbull checking out the upper entrance to the Grubb. That night in camp and the next day we replayed the SOBO leapfrog game in our minds. Most of the recent SOBOs we have seen resupplied in Sierra City. Stringbean had camped with us at Milton Creek and said he was on a mission to get to South Lake Tahoe by Friday evening (just 2 days from now, an aggressive but doable mileage goal). Yet we had passed him in the early afternoon on Day 71 and he did not come by our campsite until dusk. Although he seemed tired, he pushed on. Pitbull arrived at our site just after dark fell, and camped with us. We caught up on the rest of the village gossip with him. The next morning on Day 72, we all headed out together. We had more stunning views as we climbed back up to 8300' before dropping back down into the mid 7000s'. We enjoyed golden hour light and took a short break to explore Peter Grubb Hut. While we were there we ran into Arno, who literally ran down the trail past us the first afternoon that Stringbean passed us. He has been doing 40-mile days and yet here we were together two days later. He is gunning for the high Sierra and hopes not to resupply between Tuolumne and Kennedy Meadows South so we may now see him again. As we approached Donner Summit and I-80 we parted ways with Pitbull, who continued south hoping to make South Lake Tahoe by Saturday to have time to resupply and goof off (his term for hitting the casinos) while we headed to the highway rest stop. We will spend the rest of the day in Truckee to catch up with our good friends Becky and Bryan, resupply, and stay with them overnight. Bryan will join us for the hike from Donner Summit to Echo Lake and we are looking forward to a mini adventure with him.